2015 is off to a running start and I certainly hope you all loved January's book as much as I did. Packed with so many insights on habits and why we have them, last months book is one that I definitely plan on picking up again for a second read. 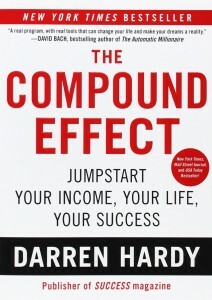 For February, we'll continue on a similar track with the book The Compound Effect by Darren Hardy. Since we learned about habits in last month's book, this month we'll learn HOW those habits, good or bad, over time determine your outcomes. This one is sure to get your wheels turning and enforce the importance of replacing old destructive habits with healthy productive ones.